Consumers buy over $200 billion of natural personal care and cleaning products, organic produce, hybrid cars, fair trade coffee, compostable plates and cups, and other green products and services. 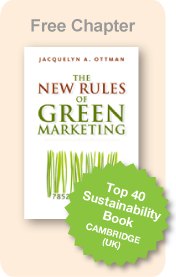 Please join me on February 4, 2010 (in New York City) for Opportunities to Market to the Green Consumer. Network with members of the Columbia Business School Alumni Club and other senior marketing professionals from New York. Listen to green marketing practitioners from HSBC, Ozocar and Sundance Channel talk about opportunities to build green brands, innovate new products and services, and contribute to the bottomline. I’ll be moderating the panel and kicking things off with a presentation on “Doing Green Marketing Right”. This event is part of a Sustainable Business Certificate Series. Attend this event and five more in the series and receive a certificate from the Columbia Business School Alumni Club of NY. Link here to learn more and to Register.